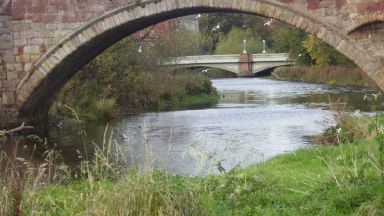 Emergency services were called to the River Tyne in Haddington, East Lothian, on Saturday. A woman had to be rescued from an icy river after going to the aid of her dog. Emergency services were called to the River Tyne at Haddington in East Lothian at about 9am on Saturday. She was helped off the ice and did not require medical treatment but the dog could not be saved. Police have now warned people not to cross frozen rivers in the area after also receiving reports of children playing on the ice. A spokesman said: "Don't be tempted to walk onto a frozen river - there is still a current flowing underneath and the surface won't look any different whether it's thick or thin. "Keep dogs under control and make sure children are aware of the dangers."